In Hilversum is a house for elderly former nurses. 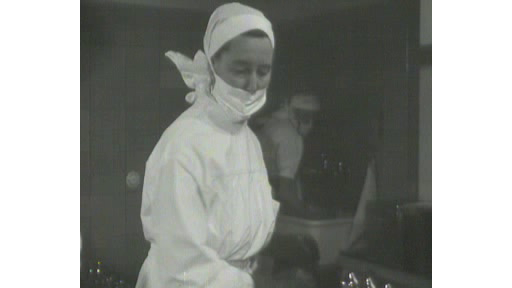 In this newsreel the focus is on the inhabitants and on the work of nurses nowadays. SHOTS: - Ext. of the house; elderley women stroll through the garden; - int. : elderley women sit at the table and eat soup; one of the women waters the flowers; in the recreation room they are reading, knitting, looking at photo's etc. ; - several shots of young nurses: maternity nurses are busy with babies; a nurse in a ward helps a girl to eat and tucks her in; operation nurses assist in the operating room; a room full of nurses receive instructions from a physician; a district nurse arrives by bicycle, stops at a house and washes an old bedridden woman inside; nurses sitting in a recreation room reading, knitting etc.